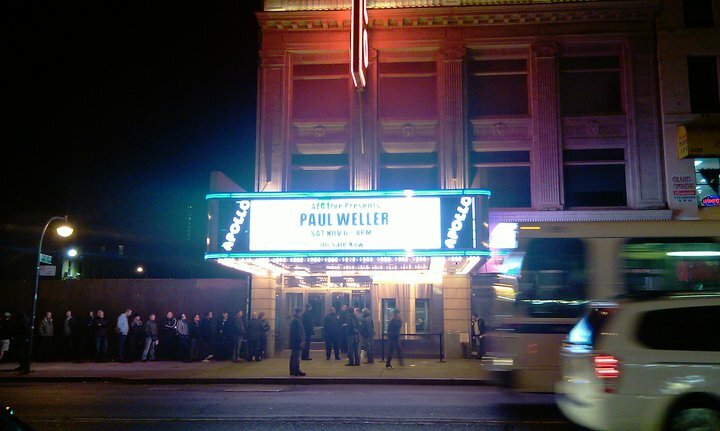 Paul Weller At The Apollo Theater in New York City! – Paul Weller News! Paul Weller At The Apollo Theater in New York City! 4 Comments on Paul Weller At The Apollo Theater in New York City! As a longtime member of Britain’s mod subculture, Paul Weller is well-versed in the transcendent powers of American soul music. Saturday night, the legendary English rocker made a pilgrimage to that genre’s most sacred temple, the Apollo Theater, where he kicked off a two-night New York City run. Backed by five young musicians with matching mod haircuts — cropped on top with tufts of hair coming down over the ears — Weller’s performance covered his career from the ’70s to the present. While the singer and guitarist focused on latter-day solo tunes, he also burned through three by the Jam, his beloved punk-era answer to The Who, and one, ‘Shout to the Top,’ by The Style Council, the slick, suave, soulful pop group he fronted throughout the ’80s. Weller also paid tribute to one of the countless legends to have graced the Apollo stage, offering his unique take on ‘How Sweet It Is (To Be Loved By You)’ — the Motown classic originally recorded by Marvin Gaye. Seated at an electric piano, Weller played the song slow and slightly somber, changing its tone from celebratory to reflective, and doing his best to wrestle the tune back from James Taylor, whose soulless rendition remains an easy-listening staple. Despite his love of ’60s music and fashion, Weller isn’t one to dwell on the past, as he proved by filling Saturday’s two-hour set with material from his latest release, ‘Wake Up the Nation’ — a diverse collection nominated earlier this year for Britain’s prestigious Mercury Prize. Anyone going to see Weller in 2010 is most likely a serious fan, and while the Jam tunes — ‘Pretty Green,’ ‘Start!’ and ‘Art School’ — proved most effective at catapulting people out of their seats, lesser known solo numbers such as ‘Come On, Let’s Go’ — a 2005 power-pop rewrite of the Undertones’ punk gem ‘Teenage Kicks’ — also had folks dancing in the aisles. 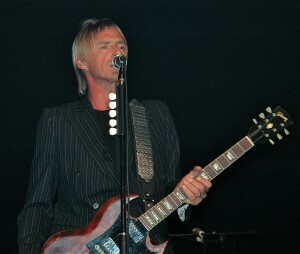 Based on the set list from his Los Angeles performance, Weller was expected to close with ‘That’s Entertainment,’ which is one of the Jam’s most enduring hits. Unfortunately, his second encore ran long and the Apollo’s 11PM curfew brought the night to a premature, albeit memorable, end. That’s showbiz. Paul with fan, Geoffrey Dicker In New York! Thanks for the track list update! Me an my girlfriend are the 6th and 7th people in line under the marquee! This was an amazing concert. I flew from Brazil to be there. Weller and the band simply held the audience captive throughout the whole set. Just don't understand why, at this point in history and culture, organizers will still refrain audiences from using their cameras, even if during a tune or two. What's so bad in bringing a picture home as a trophy or testimony of such a special moment? Not that this would have spoiled the wonderful night, but it got me mad. 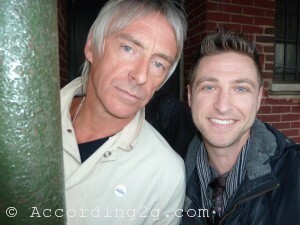 Previous Entry Paul Weller In Los Angeles November 2010!!! Next Entry Nominate Photographer Stefan Duerr For Best Vinyl Art 2010 Award!